Did you ever wonder what holiness looks like? I mean, God calls us to be holy like He is holy (Lev 11:44, 19:2). Peter echoes this call in 1 Peter 1:13-16. But what exactly does it look like? Oh if Yeshua were standing before us, it would be pretty easy to recognize it. But how do we walk it out? In a recent discussion of Leviticus 19, my rabbi said that Leviticus 19 is the heart of Torah. It is strategically set in the middle of the middle book of Torah. And what it talks about is the heart of God. This chapter opens with God’s call to holiness followed by the instruction for how to do it. So what does holiness look like? Love God with all your heart, mind, and strength because when you do, you will obey His instructions, His Torah. And when you love God, obedience plays out not only in relationship with Him, but with all His children. This is how love fulfills all the requirements of the Torah (the instructions God gave for holy living). Holiness is love for God, evidenced by obedience to His instructions; and love for each other, evidenced by care and respect for each other. 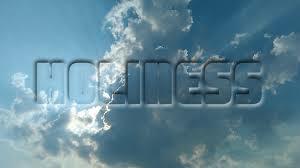 6 Responses to What Does Holiness Look Like? In its most generic sense, holiness is just “set-apartness”. We are to be separated from the ways of the rest of the world. For Jewish people, this is defined by a highly specific set of mitzvot. For the goyim, it’s not quite so mapped out. On the other hand, what was Paul trying to tell his non-Jewish disciples in all those letters. These were people living in and among pagan society. Jews in the diaspora could congregate within Jewish community, but that wasn’t so easy for the Gentile disciples who had pagan family, friends, and business associates, and who were subject to all of the laws relevant to citizens of the pagan nations. In general, Paul was commanding the non-Jewish disciples to separate themselves from the standards and behaviors of paganism. Instead of being self-centered and idol-centered, they were to focus on doing good to others, which is a cornerstone of much of Judaism, and focusing on devotion to God. True, James. However, I don’t think God would leave us to our own devices, with only a general idea of what it means to be holy as He is holy. I read Toby Janicki’s article, “The Gentile Believers Obligation to the Torah of Moses”. I like the way he lays it out. It is definitely a road map to start on the path of right living. While I don’t think we have the right to be presumptuous, I look at how God set up the Israelites in the camp. He had a general set of instructions for everyone. Why? Because they were camping around the presence of God. He had a more in depth set of instructions for the Levites, but even the foreigner had to follow the basic set of instructions because God was in the camp. If the instructions in the Torah describe what it is like to live holy in the presence of God, shouldn’t we – who have the indwelling Spirit of God in us – also live by the same set of instructions? It’s funny, but as I continue to read and review the essay’s from the Nanos and Zetterholm volume “Paul Within Judaism,” again and again, each author states that the social status of Gentile believers in Jewish community was more or less up in the air. If you haven’t read it yet, my latest review went online this morning. Paula Fredriksen, the essay’s author, states in part that Paul may have believed the Messiah’s return imminent and wasn’t particularly concerned with developing specific halachah for the Gentile, figuring that Yeshua would sort that all out in short order. I’ll have to re-read Toby’s article again in light of the current conversation going on at my blog to see if it provides any further illumination. I did read your review this morning, and it’s an interesting point of view. But I must point out, couldn’t it simply be the plain meaning of the text “for from the earliest times Moshe has had in every city those who proclaim him, with his words being read in the synagogues every Shabbat.” (Acts 15:21). So there would be no need to develop a separate set of instructions, whether Yeshua returned right away or was delayed. I especially found this article confirming to things I’ve read in the Word as pertaining to being like the Lord. Such as Luke 6.36: “Therefore be merciful, just as your Father also is merciful”. That mercy, or a better translation for the Greek, “compassion”, being the active principal of love. Thank you for pointing that out John.